Foie gras of duck, confits (salt-cured), pies, rillettes, cassoulet – in fact we process every kind of fattened duck. Red fruit jams, fruit juices, farm cider, cider vinegar. Sweet chestnuts, small fruits, potatoes, ewe breeding, cows and goats. Organic farming. Farm Shop. Farm shop and visit by prior appointment. Flour of sweet chestnuts, chestnut pieces, juice and jams. We also sell “seasonal baskets” depending on our seasonal fruit and vegetables crops. Sweet chestnuts, creams (8 different tastes), cream with honey, 3 creams with rice malt, mashed chestnut purée without sugar, spread, flour, dry and crumbled sweet chestnuts, chestnuts for aperitifs, soup. Pourette et Bouche Rouge chestnut varieties. Also on sale also at Jaujac market on Fridays. Mountain honey and honey from many flowers. This bee-keeper was awarded the “Monts d’Ardèche Regional Nature Park Producer” label, hallmarking artisanal know-how with all the values of the Park. The Pestrin springs rise near the ancient medieval city of Meyras, in the middle of the Ardèche Volcanoes, in wild and unspoilt nature. Sheep farmers in the Lafarre valley at BARNAS. Farm shop selling sweet chestnuts, ewes, lambs and ewe-lambs. Lambs raised in the open air, in free-range grass pasture. Live weight approximately 40kgs. Farm shop and market stall sales of seasonal vegetables and fruits (peaches, strawberries, salads, potatoes…) as well as poultry and eggs. Apples, sweet chestnuts, kiwis, plums, vegetables in season, apple juice, dried fruits, jams, syrups, compotes, chestnut spread, chestnut flour and chestnut pieces. Farm shop and market stall. Vegetables, fruit, home-made jams and fruit juice. Farm shop. 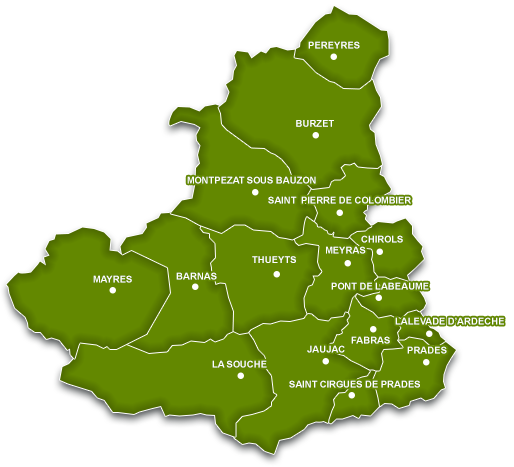 We have been processing fruits from the Ardèche at la Souche since 1964. All the recipes we produce are original and were created in-house, without the use of conservatives and synthetic colouring agents. The range is continually renewed. Why not visit our saffron plantation, an enthralling and natural crop entirely worked by hand, to admire this magic flower. Visits only by prior appointment. Juices of mountain apples, apple & flowers, raspberries, bilberries, blackcurrants, plums, elder and rose. Coulis and cider. Shop open by prior appointment only. Mountain produce. Provençal and Sardinian donkey breeding. The oldest brand of Nougat in Ardèche. Homemade nougat, calissons, chocolates, pralines. Free tour and tasting: 1 hour. Maître Artisan Glacier (master craftsman icecream maker) Thierry Aigon wanted to share his passion by creating Aux Glaces de Mon Père. Here, you’ll discover the only icecream museum in France. A trip to the land of icecream! Traditional Nougat, a delicious sweetmeat made with honey and almonds. Genuine Ardèche Nougat made with local honey and a generous proportion of almonds. Free from artificial colourings or flavourings. Products stamped with French quality label “Goûtez l’Ardèche”.